Today’s materials research reveals new possibilities through intelligent combinations. More functional and resilient. Smaller and lighter, too. 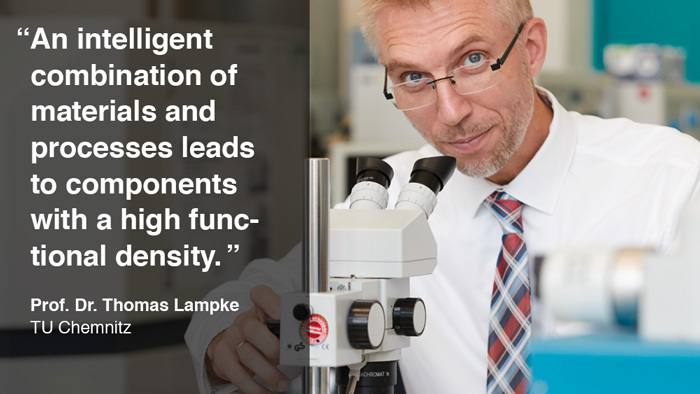 These terms represent component properties that couldn’t be more contradictory —yet they’re part of the everyday routine for Thomas Lampke, Professor of Materials and Surface Engineering at TU Chemnitz. He told us about the answers that research and development hold in store for requirements like these. Pursuing matters until they can be defined and understood. Spanning the range from the atom to the finished component. Fine tuning the triad of process, material structure and properties profile. These things sum up the fascination of materials research for Prof. Dr. Ing. Thomas Lampke, Head of the Materials and Surface Engineering Group at the Chemnitz Technical University (Germany). His path to Chemnitz was laid out shortly after the conclusion of his studies in mechanical engineering in Bremen. At the beginning of the 1990s, after the German reunification, he intended to pursue further study and research here. Instead, his post-doctoral opportunities included research activities as a visiting professor in Ontario, Canada, and Limoges, France, followed by subsequent teaching engagements in Chemnitz and at Paderborn University in Germany. During this time, the design of technical surfaces with functional properties, hybrid structures and the development of combined surface technologies got under his skin. He became intrigued by the way materials often drive innovations. What is even more important to him, however, is the long-term perspective: research based on genuine curiosity without expected benefits as the primary objective. To safeguard current technological leads as well as prosperity, research must address society’s needs, then meet them with reproducible results and valid findings from both fundamental research and application research. The “and” here is important to him: the one must not exclude the other. Moreover, he says, research requires continuity without losing its currency. This is undoubtedly one reason why he maintains focus on what materials will promote sustainable, energy-efficient production and use of products. He is also of the opinion that this question is more sociopolitical than technical. Prof. Lampke, what do you associate with the term sustainability in reference to materials engineering? For me, sustainability means really thinking something through from its inception to its completion. The first thing I see is the availability of the material: Are the materials available in sufficiently large quantities? Are the deposits of these — often in crisis zones — geologically accessible, and is exploitation practicable from a political, economic and ecological perspective? What value creation is possible with these materials, especially as rare earths and noble metals are traded in a highly speculative manner on the markets? These aspects are powerful innovation drivers. In addition to the question of energy efficiency? Correct. Bionically optimized materials, lightweight construction — these are megatrends. From our perspective, this requires a “bivalent strategy”: If we are energy efficient in production, then we want that to be just as much the case in the application. And this is where lightweight construction in terms of both materials and design can be a great help — with the right materials in the right places. This is also where the loop from availability, via the application of a component to recycling, is closed. Is it true that modern materials must also deliver more and more performance? One of the requirements for modern materials is indeed that with their use, the performance density of the component can be increased. With increasingly complex geometries and great cost pressure, the load profile also becomes more challenging. “Light” and “manufacturable” are only two necessary, but by no means sufficient, requirements, even if they are the most important. Materials need to perform better, but presumably also need to last longer? Yes, increased service life is a big topic, which we are researching together with Oerlikon, incidentally. With systems that deliver more and more performance, for example high-performance jet engines in aerospace, an increasing number of components are subject to extraordinary thermal loading where an improvement in service life is essential. That has been accomplished today in a meaningful sense, although especially in cases like these, the requirements for performance density, longevity and robustness have grown disproportionately. What options are available for increasing service life in this case? One of the options we see for accomplishing this lies in a combination of surface technologies. Using various different known processes, we attempt to foster the creation of new layer morphologies and layer structures in a simple yet sophisticated manner. Initial results suggest service life increases in the two-digit percent range. How do you solve this specifically for this application? The investigation of aging processes has revealed that the oxygen absorption of the material must be controlled and limited. Oxidation processes alter the metallic material. The morphology changes; the material becomes brittle. Cracks can form quickly which then lead to total failure. In our concrete collaboration, we are dealing with the application of aluminum-based intermediate layers which, as an interdiffusion layer, form what is known as a TGO layer (Thermally Grown Oxide), thereby stabilizing the connection of the adhesive layer and the top layer. This suppresses the growth of undesired phases, and the barrier effect appears to be very positive. The general area of “combined surface technologies” is a main emphasis of your research. Why? Very frequently, the properties profile of a component — and this immediately includes the costs — can be achieved only through the use of less expensive materials, such as surface finishing and coating processes. I am generally of the opinion that a process must be a means to an end and should not find its way into future process sequences based merely on the present-day know-how of a company. If progress can be achieved through the further refinement of a process, then that is one possibility. Beyond this, the interaction of different processes can be a means to an end both technologically and economically — provided that the process capability is a given. Concretely in this case, it means that we try to combine processes. For example, by reinforcing a layer applied by means of thin film technology, PVD or CVD (Physical/Chemical Vapor Deposition) with a second layer applied using a different process. That could be thermal spraying or electroplating, for example. But a lot of work still needs to be done at the technique/process/material interfaces. The problem is that the respective process understanding, especially in relatively small, highly specialized companies, is present only in the discipline of one technology. And this is where we see the greatest opportunity for companies like Oerlikon: They have a command of various technologies and already use combinations of these, or are endeavoring to do so. What are the drivers you see in particular for combining various processes? I see one driver for combining surface technologies in the substitution of high-priced substrate or coating materials. Here it would be possible to attain very good results through applying a coating or through thermal, chemical or thermochemical treatments in combination. Another is undoubtedly found in additive manufacturing. It will most certainly alter classic processes in a disruptive manner, but it will not be able to replace all manufacturing processes. That would be virtually impossible even for reasons of cost alone. Consequently, printed structures for high-load components will be subjected to subsequent heat treatment or surface treatment processes. The reason will be to create the component properties that are actually required. Structural properties and surface properties are actually two very different topics here. A further application for surface engineering deals with lightweight structures. And I mean very light components, such as those based on high-performance polymers like polyether ether ketone (PEEK) or carbon-fiber reinforced carbons (CC), which we functionalize by means of thermal spraying. Based on a demonstrator, we were able to attain an outstanding result here in Chemnitz: We succeeded in functionalizing a carbon-fiber reinforced plastic (CRP), in this case based on a polyamide, using bronze, steel or INVAR multiple-layer coatings which produced a 50 percent weight reduction as well as a reduction of thermal longitudinal expansion of up to 90 percent. What new materials are you working with now? (Laughs.) There are many directions. One exciting topic is that of High Entropy Alloys (HEA), as they are known. They do not consist of one main element and a few additional alloying elements in a low concentration, but instead of a mixture in equal parts of usually four or five metallic elements. They were discovered already a number of years ago and possess exceptional strength as well as being temperature and wear resistant. Of course, the question begs to be asked whether the properties known in the “full material” can also be transferred using surface technologies. We are conducting intensive research on this in Chemnitz. For example, in the application of entirely new materials based on high entropy alloys by means of thermal spraying. What also seems very promising is the use of amorphous metal in surface engineering. “Metallic glass” types are usually iron-based, metal alloys which solidify amorphously and have truly unique physical properties: they are harder and more corrosion resistant than customary metals. We are now conducting research on controlling the existing advantages metallurgically and via the solidification in such a way as to maximize the mechanical and physical properties. Have the “old” materials outlived their usefulness? Definitely not. We are once again turning more attention to readily available and simple materials and their refinement. Even good old iron and steel have become very modern through new developmental trends. Steel, especially, is a much sought after and highly interesting material with respect to new increases in strength accompanied by sufficient ductility and toughness, availability, recyclability and the nearly inexhaustible possibilities for shaping it. For me, at least, there is no end for it in sight. If you were to summarize the various facets of materials developments, what would be the most important from the perspective of the materials scientist? Science is always driven by questioning and the desire to get to the bottom of things and truly understand them. Many effects and interrelationships are fundamentally known to materials science and their exploitation and transfer are frequently in focus when it comes to finding concrete solutions for challenges. That this is of great importance for surface engineering is made clear by the example of corrosion and wear. And this is not just a coincidence: Estimates reveal that the damage resulting from both corrosion and wear causes a loss amounting to four percent each of the gross national income (GNI) — every year. For Germany, the GNI in 2017 amounted to about 3.3 trillion euros. Two times four percent makes 265 billion euros. I would consider that to be a significant amount. It is generally believed that if we were to succeed in transferring the knowledge which already exists to present applications, this loss figure could already be reduced by 20 percent. Does that mean, then, that we actually already know how to improve materials with respect to corrosion and wear, but just don’t do so? One could say this is a problem of the cascade of knowledge: A great deal of effort is required before things that are known scientifically and are technically feasible are actually implemented and innovations are made. Of course, that might cost money initially. But the money is then saved on the other side. That means an equilibrium here would be counterproductive. And that is one reason why linking good university teaching, fundamental research and the transfer of knowledge via “heads” into businesses is of decisive importance for Europe’s business environment and to safeguard our prosperity. We offer a very attractive degree course dealing with this area in Chemnitz. One thing is certain in any case: My team and I are excited about the future! Univ.-Prof. Dr.-Ing. habil. Thomas Lampke received his doctorate in 2001 at the TU Chemnitz. Since 2008 he has been the professor of Materials and Surface Engineering at the Mechanical Engineering faculty there. He is a member of the TU Chemnitz Senate and has been the dean of the faculty for Mechanical Engineering since 2016. Prof. Lampke is also a review board member of the German Research Foundation (DFG), is active on various boards of scientific-technological associations and provides expert opinions for numerous prestigious international professional journals. Self-healing, communicative – and soon more to come? Battling the elements is a challenge. Mastering them is an art. When nature’s conditions are truly extreme, coating ingenuity is revealed.